Cauliflower makes a wonderful sauce for pasta–either with tomato or without. 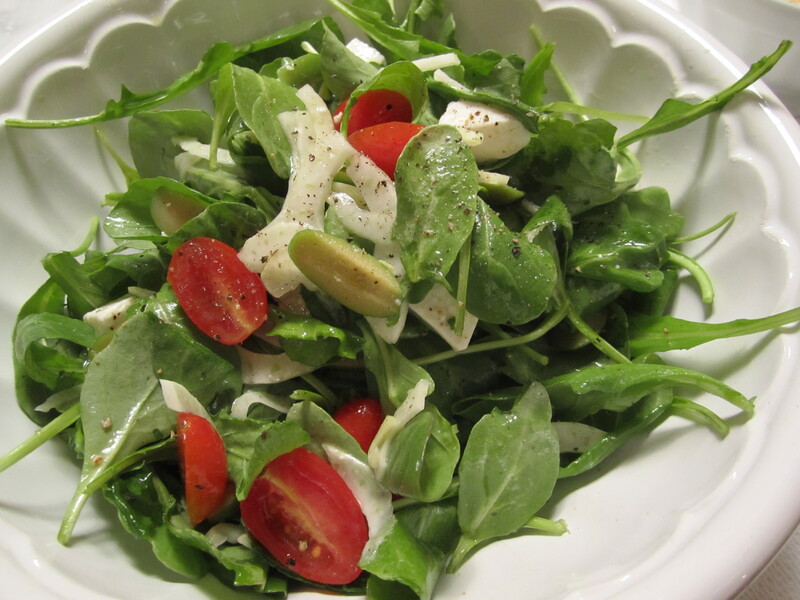 Tonight, I’m in the mood for it cooked “in bianco,” as Italians would refer to the non-tomato version of a dish. Instead of tomato sauce for moisture, I’m using a touch of white wine, and chicken broth. Sage is also wonderful with cauliflower, and I happen to have some in the fridge from my pasta with sage and butter about a week ago (sage keeps its flavor well even if it starts to dry and wilt). The sausage is removed from its casing and chopped finely as it’s sauteed. This will disburse the flavors in the sausage throughout the sauce. No bre-boiling of the cauliflower is necessary–I simply cut it up into small pieces and saute it in olive oil with some sage leaves. I brown the sausage in a separate skillet, then combine it with the cauliflower when they are each cooked. Then comes the addition of white wine and broth. 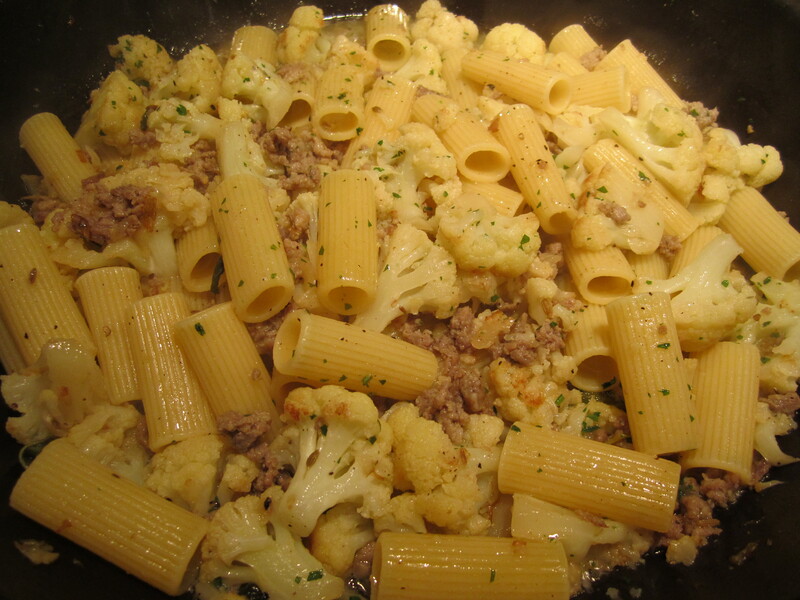 Once the pasta is cooked, it’s added to the skillet with the cauliflower, along with some of its cooking liquid, then all is sauteed for a minute. More olive oil is drizzled over the top, as well as parsley, lots of parmiggiano cheese and black pepper. Tonight I’m serving this pasta with a simple salad of baby arugula, shaved fennel, grape tomatoes, cubes of fresh mozzarella and slices of green olives, dressed with olive oil and lemon–the perfect bright, light counterpoint to the earthy sausage and cauliflower. Saute sausage in a skillet, while breaking it up with the spatula until it just begins to brown and there is no more pink left. Set aside. 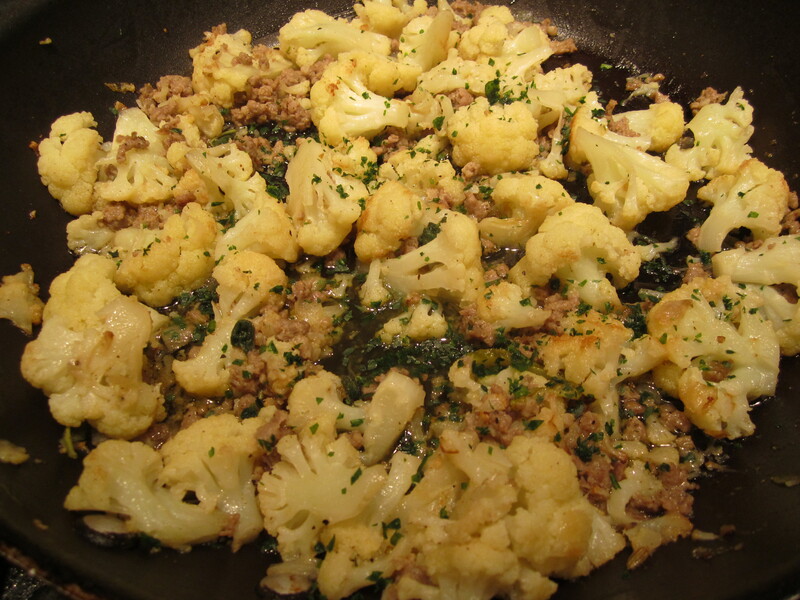 In a large skillet, saute cauliflower in 3 tablespoons of the olive oil with the sage leaves–partially covered. Remove cover and stir or shake every couple of minutes, until it begins to turn golden. Boil pasta. When pasta is about 5 minutes away from being done, raise heat under the cauliflower and add white wine. Cook until wine has evaporated (about 3 minutes). Add broth and let simmer, uncovered until pasta is cooked. 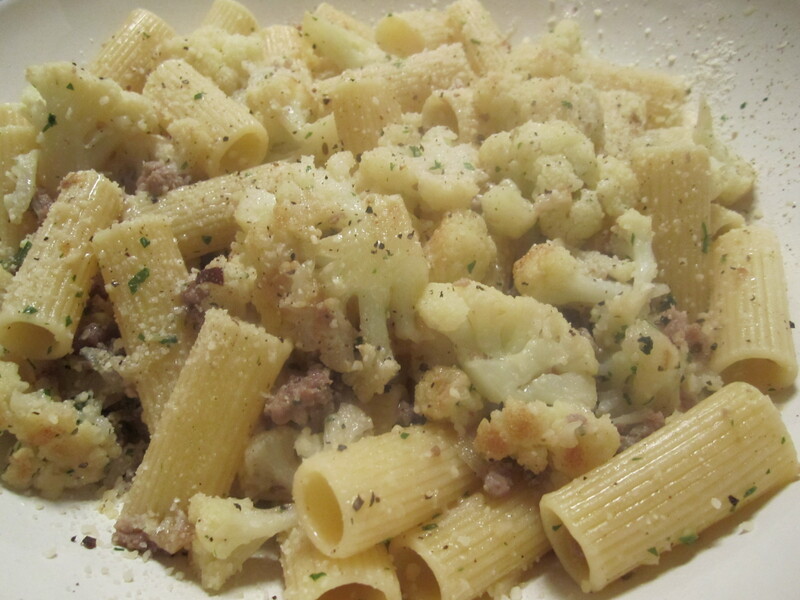 Add rigatoni to the skillet with the cauliflower, along with about 1/2 cup of pasta cooking liquid. Saute on high heat for a minute or so. Off the heat, drizzle with oil and sprinkle with grated cheese and black pepper.